I’m making the most of what I have this month! This page will be my log of what we eat, how we organize, and what we spend in the month of July. Dinner – In-N-Out Burger for 8 people < $23. Homemade malts made at home. Lunch – A Smorgasbord: Annie’s Mac and Cheese, some freezer sandwiches, Strawberries, Carrots, Cucumbers, and a Salad for me. After my baking debacle of a few days ago, I have returned to Artisan Bread and everyone is so pleased. So easy and quick! Yes, dinner was a little carb heavy today. We’re actually running low on produce. Think we’ll do apple slices for dessert and call it good. Hubs and I had a big discussion about the benefits of making my own hamburger and hot dog buns, the main one being that the spongy things that the grocery stores sell are no longer an inexpensive food item. I used to find them as low as 25 cents a package on sale. No more. We’re lucky to see them under $2. I haven’t done a price comparison, but I’d rather make my own than waste my two dollars. Lunch – Shredded Beef Burritos for hubs and the kids. I had a packet of frozen shredded beef in the freezer and some leftover rice from an earlier meal. 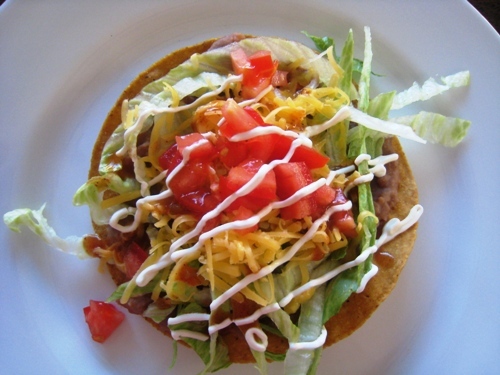 Add salsa, grated cheese, shredded lettuce, canned black beans and sour cream and they’ve got easy burritos. Salade Nicoise for me since I’m trying to slim down. The salad fixins were leftovers from our sandwiches yesterday. Delicious! Dinner – Out to dinner as a family < $40 for 8 people; ice cream dessert at home. Hubs surprised me by bringing home baguettes. Remember how I said the fam doesn’t realize we’re on a pantry challenge. It was a sweet surprise, however, I had no sandwich meat and didn’t want to go buy something. 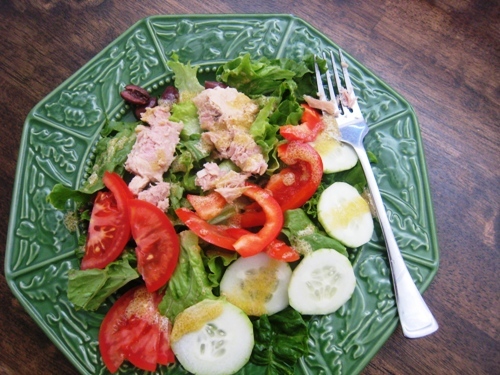 Canned tuna came to the rescue in a delicious, traditional French sandwich. The recipe for grilled pizza will be coming soon. It’s a great way to get out of the kitchen. I had a few flops this week — too high heat which resulted in burnt crust. But, I love it that there are fewer dishes to wash, so I’m going to keep trying. The recipe for Blueberry Nutmeg Muffins is coming next week. Delicious! I had originally planned to make burgers with the turkey, but since I found tortillas that needed to be used up, I went for enchiladas instead. 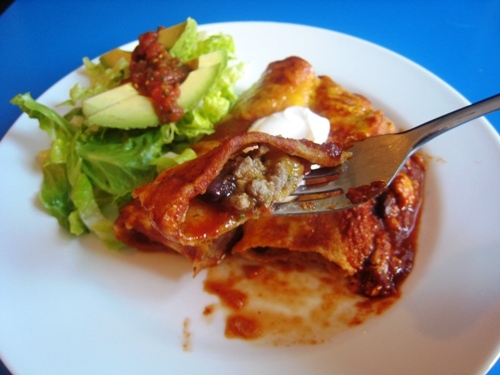 Thanks to a well-stocked pantry, I had enchilada sauce and black beans already. The cheese supply was a little low, but we had enough to get through. The bread and radishes were purchases at Farmers’ Market this afternoon. Unfortunately, farmer’s markets trips are not what I wish they were. Prices are high and sellers non-too friendly. I’m watching what I eat so I had a big salad with garbanzo beans, corn, peppers, tomatoes, and feta. I had another taco salad with last night’s leftovers. Dinner – Chicken Taco Salad, using the leftover chicken from 2 nights ago, lettuce, rice, black beans, chips, and a great mix of toppings. 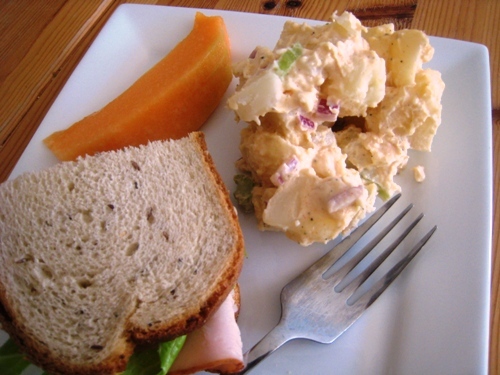 Lunch – Turkey Sandwiches, Beef and Barley Soup from the freezer. Breakfast – a mishmash of whatever since we were in a rush to get to the ortho. 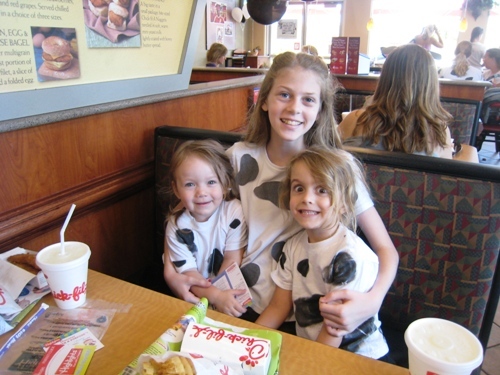 Lunch – We dressed like cows! It was so much fun to go with some friends of ours. Our two herds added up to two cows and 11 calves! Dinner – Spaghetti with meatballs, cornbread, green beans. 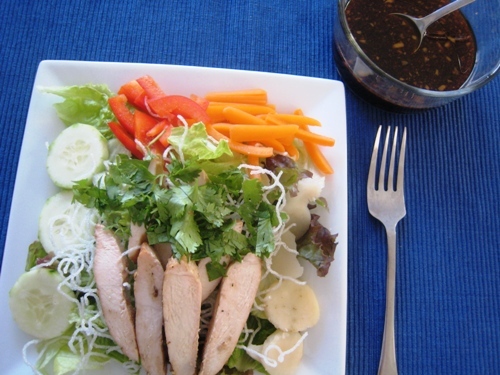 Lunch – Snacky lunch for the kids; salad with hard boiled egg for me. Breakfast – Made Maple Granola without the mixins. 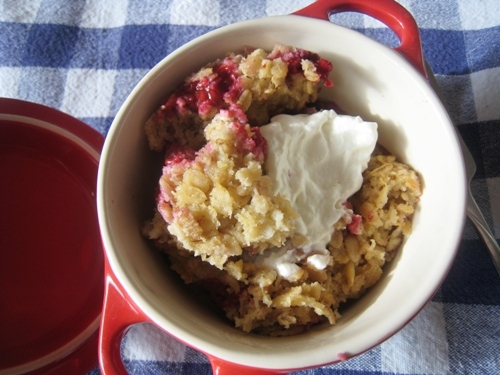 Served it with fresh raspberries (again, those dollar berries) and yogurt and milk. We have been out of town for the last three days, and I’ve been offline. Not a whole lot to report. We ate some meals out and some meals at the grandparents’ house. 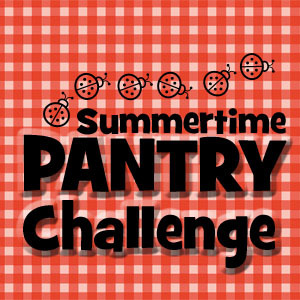 Ready to get back to the pantry challenge — tomorrow. 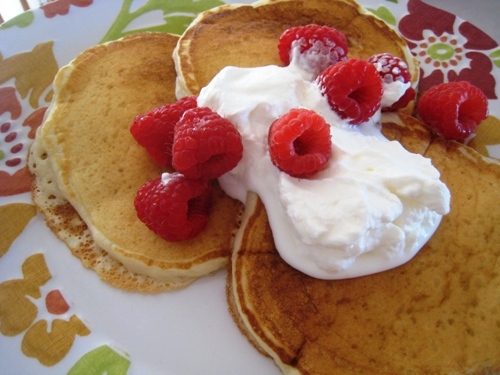 Breakfast – Bulk batch of pancakes with fresh whipped cream and more raspberries that I got for $1 a package. Out of many dairy products and a few other staples, so contemplating a trip to Walmart. Dinner – Made homemade pizza tonight – 1 Jalapeno Burn and 3 Pepperonis. Well, the last pepperoni was half pepperoni and half salami. Making do with what we have! Lunch out – Hubs forgot his phone at home and since he needs it for work, we ran over there and met him for lunch. Spent < $40 for 8 people. That’s the high end of our eating out spending, but everyone was stuffed. I’m really looking forward to following this series! I love the Pantry Series! The timing is absolutely perfect! My inlaws just left, which means a ton of half-opened things (8 different types of half-eaten breads, several cheeses, three bags of different lettuce, etc.) I love when they visit and I get lots of extra goodies to play with in the kitchen. We’re also getting ready for a vacation and need to clean out the fridge and freezers before we go. Of course, money’s tight with the upcoming vaca… so your pantry cleaning inspiration is perfect. 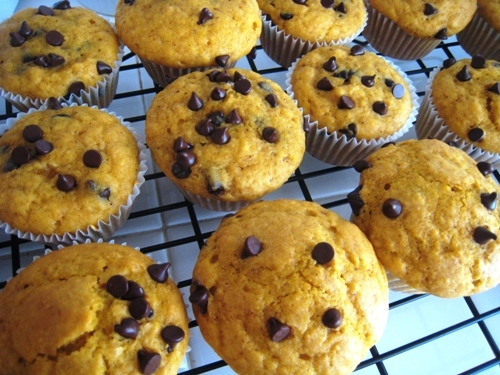 I really, really, really am looking forward to the pumpkin scone recipe – I was wondering what I could do with that last can of pumpkin in the pantry. Oops! I would have sworn I read “Beef and Barfey Soup” … I’m certain that’s what I read 🙂 I’ve got quite a bit of cream in the fridge (um, 3 quarts) that I need to use up soon…thinking of that fresh whip cream you linked up to (and maybe some ice cream too) … enjoying the play by play you share! I gave my hubby the grocery money for the rest of the month and told him to hold on to it until the end of next week. I do have WIC for perishables so I am going to try to empty out some of our abundant pantry and freezer.